As I said in my previous blogpost…. 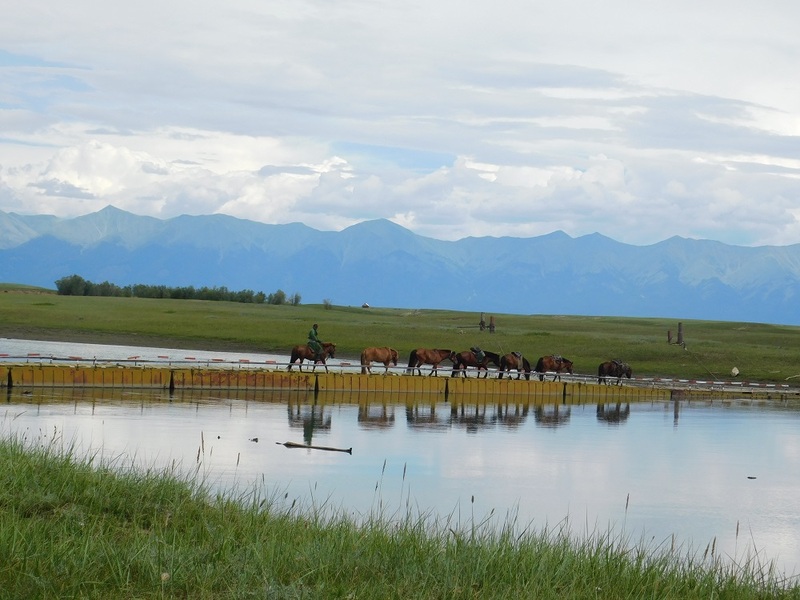 Cancelled flight, lost baggage, overheating car ride.. We rode along the beautiful Lake Khovsgul, crossed rivers, vast Mongolian Steppes, sand pits, forests, miles of bogs, mountain tops, tundra. We endured record heat, wind and rain, epic hail, lighting, frost and icy cold nights. It was the stuff of which memories are made. It was an EPIC adventure. As I sit in my living room sipping a perfectly made latte (by Tim) & reflect on the trip… a mix of emotions washes over me. Happy to be home. Awestruck by what I have experienced. Thankful and proud to be born American. 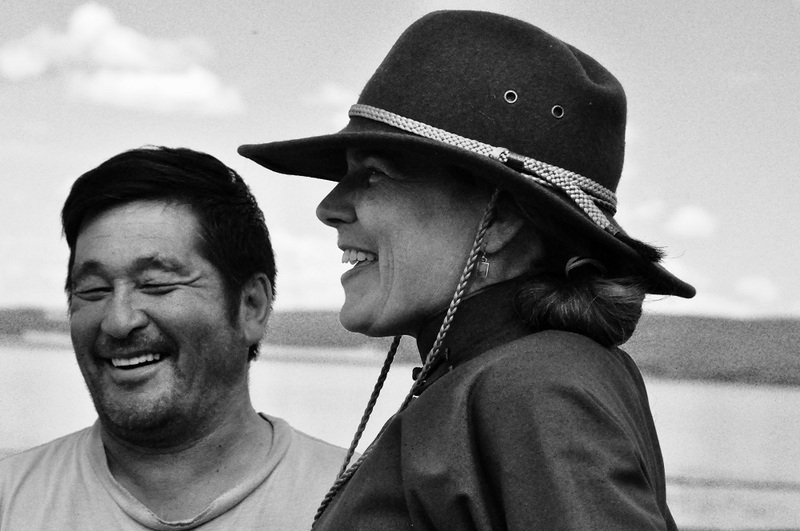 Excited to share, yet concerned that I will not be able to convey the magnificence of this trip, and yes…. 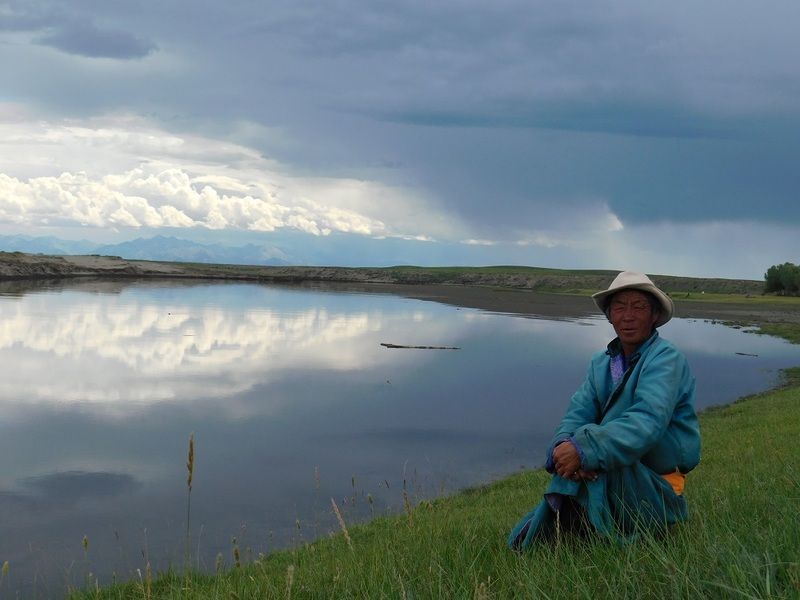 missing Mongolia. 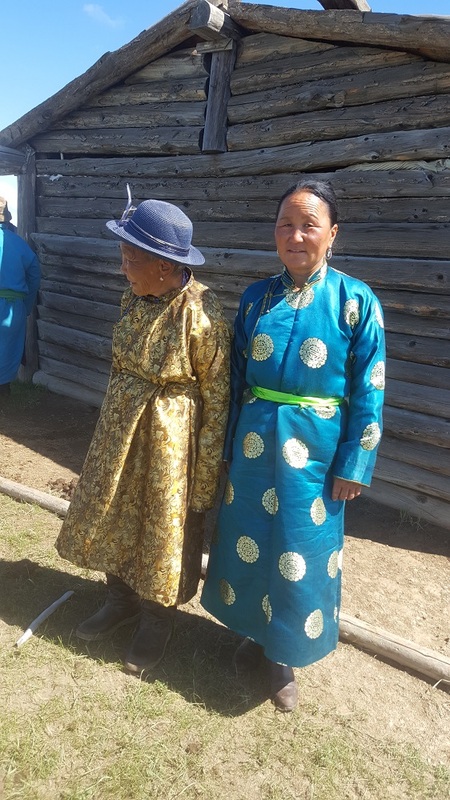 Day 1- News from Ulaan Bataar, Miriam has retrieved Lorna’s bag. Glad it has been found…. Bummer that it too late. I turned on my GPS the night prior & sent a message. Wasn't sure if anyone got it. I found out later indeed, many of you were following the map as my GPS pinged. Pretty cool. Here’s where we were! All fitted up for our journey, I have named my grey gelding “Heri” in honor of the pony who taught me to be a horseman. 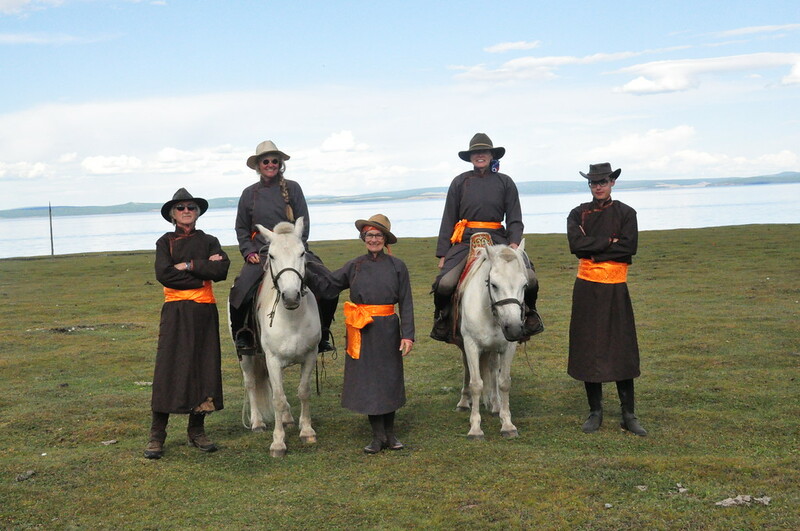 Getting to know our mounts, we followed beautiful Lake Khosvgal (I’ve seen this spelled about 6 ways). We camped that night near the lake shore in a meadow filled with wildflowers. Oh the stars! The “Hotel CarLorna” is a million star accommodation. What a great sound to awaken to the horses munching grass just outside our tent. 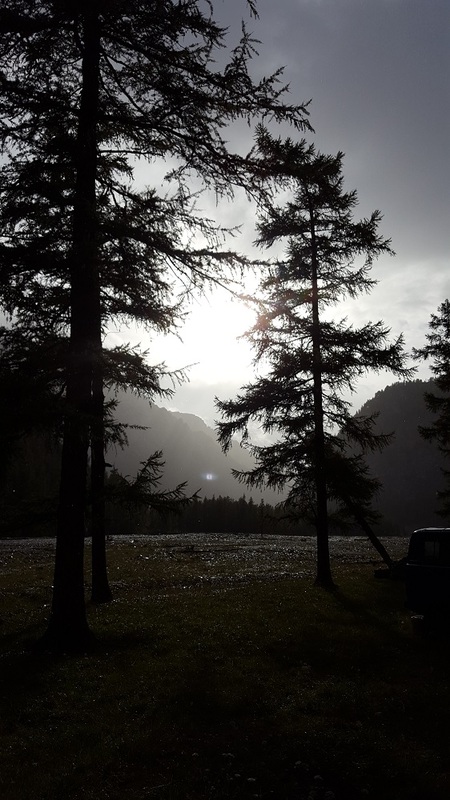 Day 2 – Perfect morning riding along the lake.Glorious sun gave way to clouds as we began to ride through some boggy terrain as more ominous clouds rolled in. Then…the rain… & cold. As was my biggest dread (I am a fair-weather rider) it rained, & rained, & rained. We found sanctuary in the trees as we waited for our support to arrive. Finally, our guides had to ride out to find the trucks. Sure enough, they were stuck in the bog. Big fire, drying out. Our accommodations by the lake were once again lovely. 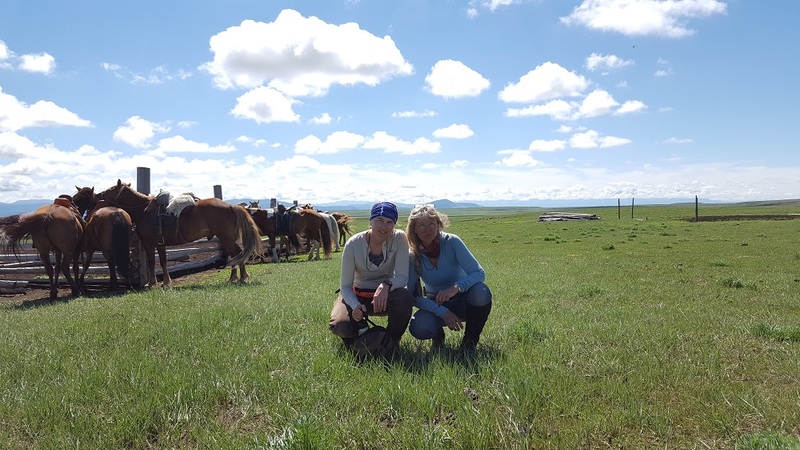 Day 3 – Ill riders… One was having a rough day & finally relented to ride in the van. Our guides bound him up in a deel belt to quell the unsettled stomach. 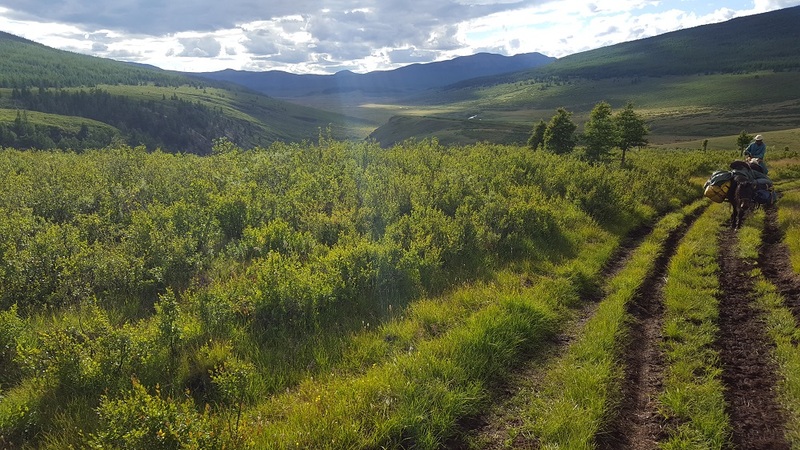 The trail led us from the lake and followed a dry river bed. Here we are taking a break along the trail. The Mane makes a great sun mask! 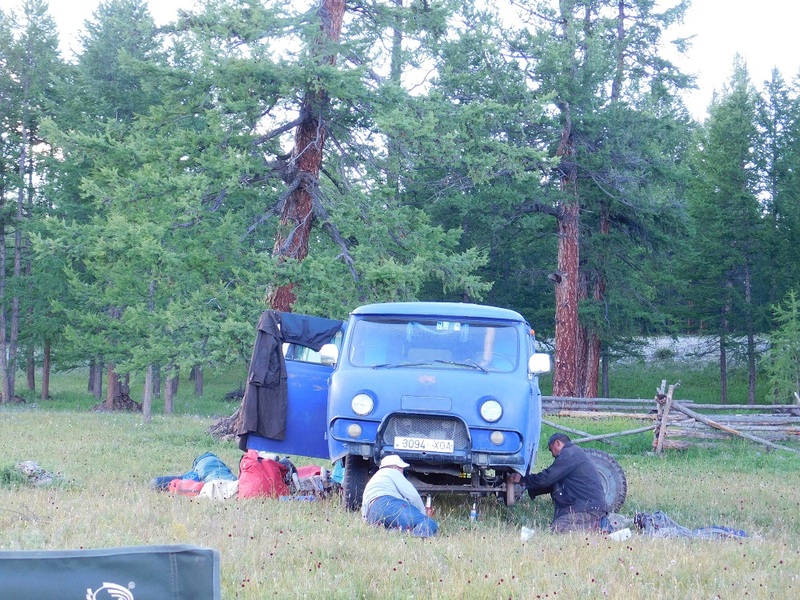 We camped near the Arsaan River at the edge of the forest. The sunset cast a warm glow on the horses. It seemed they were always fixing both support vehicles. This sight was almost every day, Instead of Sudoku. Today we needed to make up some time, so the walk became trot, the trot became canter & soon we were galloping through the meadows of edelweiss wrought with vermin holes following the “road” (Dry river bed, laid down grass, dirt, sand). Goal was 60K before camp. During the ride, it was all about taking in the beauty of the landscape through all my senses. Mountains, vast Steppe, fields of Edelweiss and other wildflowers. 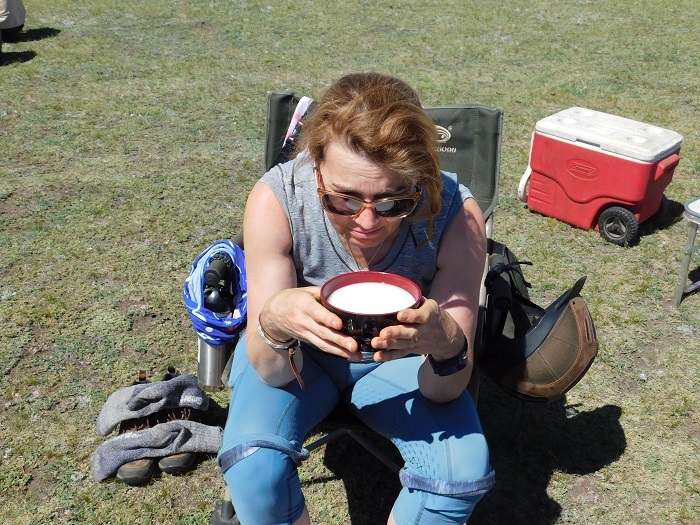 The fragrant sage mixed with various wildflowers on the Steppe filled my palette with every breath. The Larch and pines created a woodland scent like no other. The cool mountain air and even the smell of rain was unique. 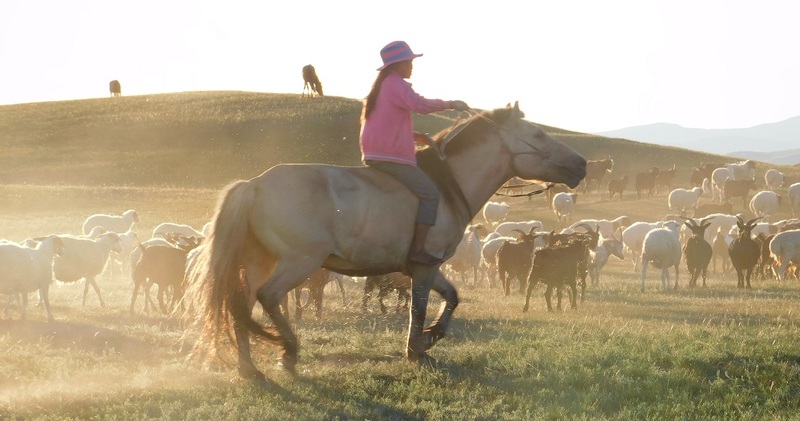 The sight of herds horses, cattle, yak, sheep…. and the people…..These beautiful people. Conversations with my fellow trekkers were a learning experience all alone. I was the only one on the trip who had not traveled internationally, (you can’t count North America.) They were from all walks of life with different experiences and the conversations ranged from serious political to silly movies, travel to home life, oddly…very little about work! It was an intellectual group, no minutia. 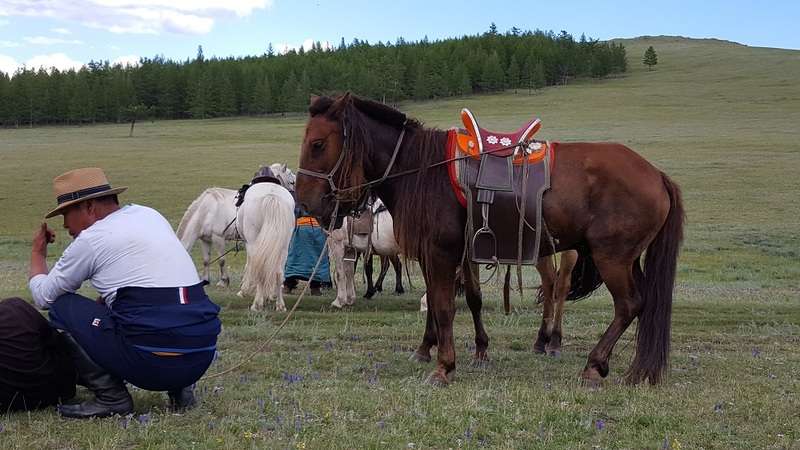 Conversations through Zulaa (our interpreter) were directed at the horse culture.I was curious about training and the abilities of these hearty horses to do a special amble sort of gait. So they start them much like we do. The foals are tied, both so that they learn to stand quietly tied, also so that the mares can be milked. (more about that later). 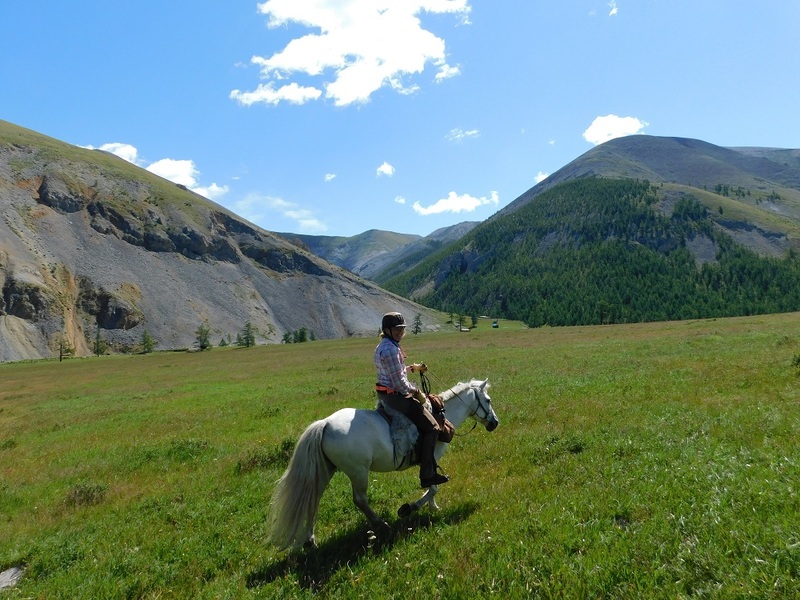 Horses are stated at 2 years old and are basically saddled & ridden. No ground work, no “joining up”… just old school saddle up & go! Since they are turned loose with no fences, they turn a little feral each winter. For this reason, we were asked to get to know the horses for the first 3 days of the trek before taking photos from horseback. No drinking from water bottles, no taking off a layer of clothing.And boy howdy, did we see them spook! Just like home, right? 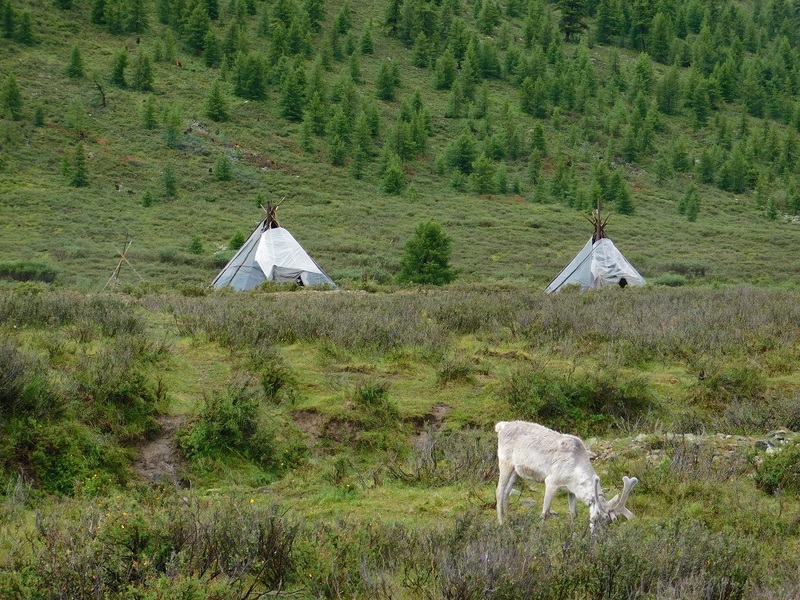 Camp was in the wide open steppe near a winter place. 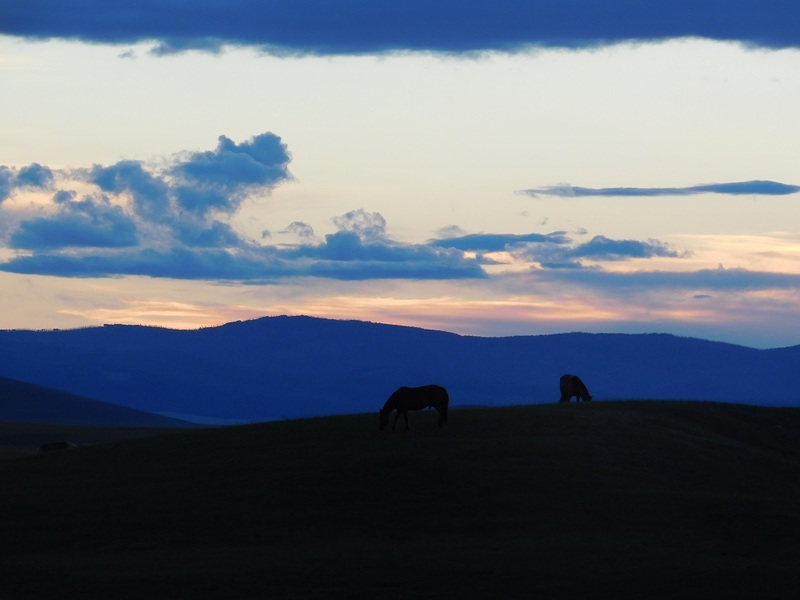 These are scattered across northern Mongolia. Many of the people who live in Gers in the northern region move into a location with corals, log sheds and sometimes a cabin for the harsh winter months. Day 5- Temperatures rose through the night and into the day. 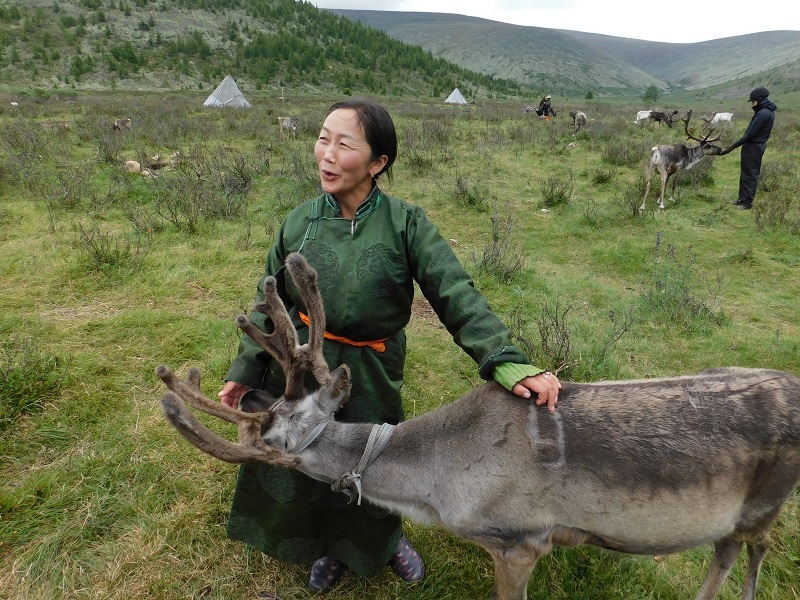 We handed over our passports to Julie & Baagii so they could get our permits for entrance to the region were the Tsaatan (Reindeer people) live.Let me tell you, it’s a bit unnerving to see someone drive off with your passport in a foreign country. So, with a big gulp, we rode in another direction & hoped to meet back up in a several hours. 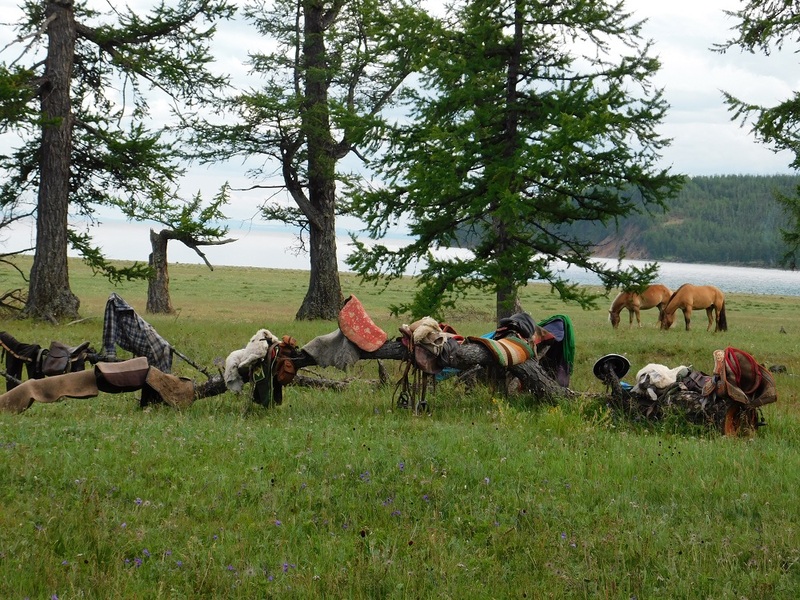 More Steppe, trotting & cantering, yaks, horses, goats, sheep, more horses. 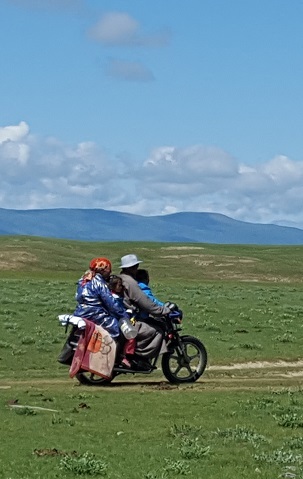 We stopped at a winter place for our morning break just as a family was coming by on a motorcycle…yes, that’s 4 people on a motorbike! There were already people there resting from travel. We visited for a bit & then were on our way. I think they enjoyed the photo op as much as we did!! Perfect timing, as we met back up with Julie and Baagii at a river crossing for lunch where a cooldown dip in the river (after much coercion from Lorna & Julie) felt great! Wetting down my Mane kept me cool for a few hours. Afternoon rest. I just love his wild mane...they cut them to stay cool and so they are able to see. 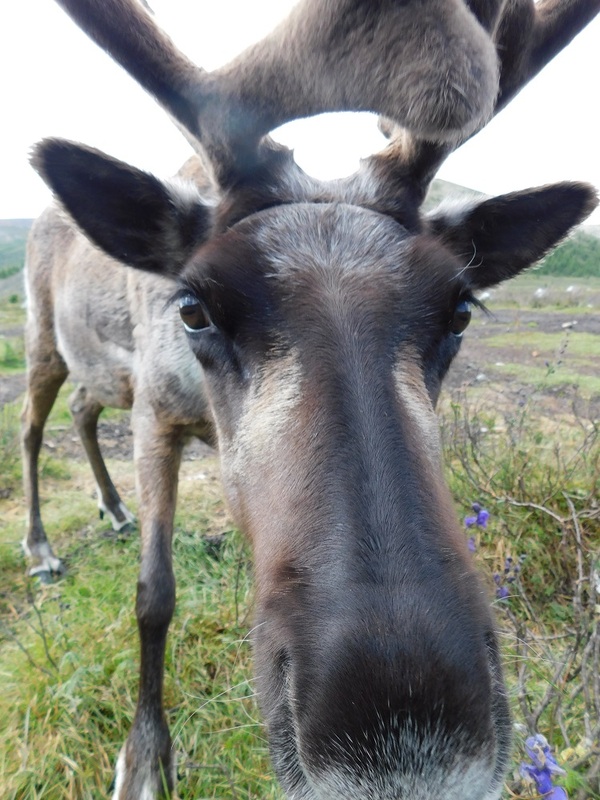 Day 6- Ride to the Reindeer! Early start in the cold drizzle that morning, we took only what we needed on our mounts and on pack horses, leaving behind extras with the drivers and one cook. 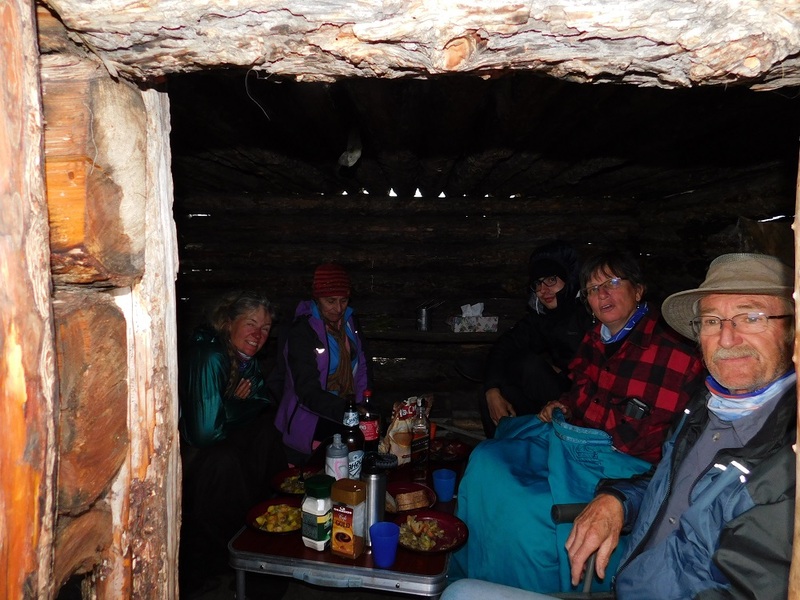 Our team of 5 tourists, Julie, one cook and 6 guides left camp for the Tsaatan Village. We would be 13 of fewer than 300 people allowed into that region each year. 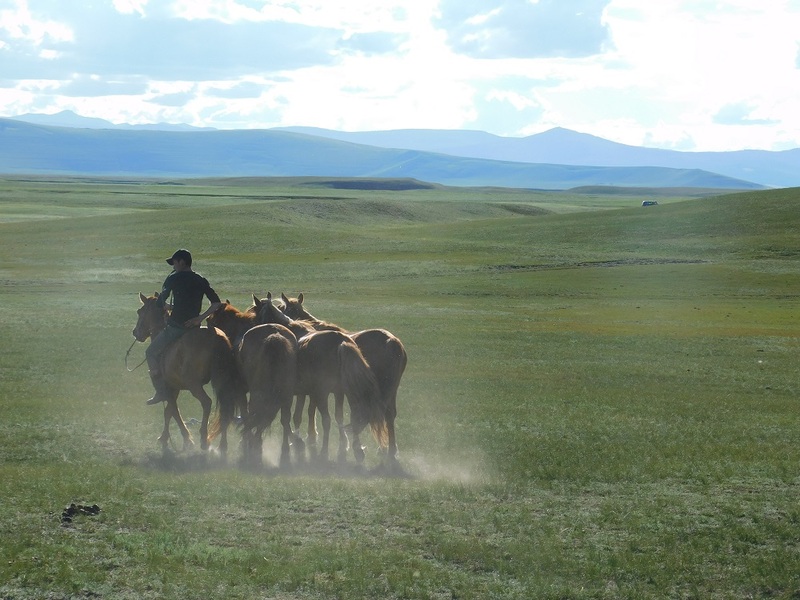 Riding the vast open Steppe, we stopped and waited while our guides repacked the pack horses that were loaded in the rain. The loads needed to be secure before we headed into the bog. FIVE MILES OF BOG!It was wet, sloppy and sometimes dangerous footing. 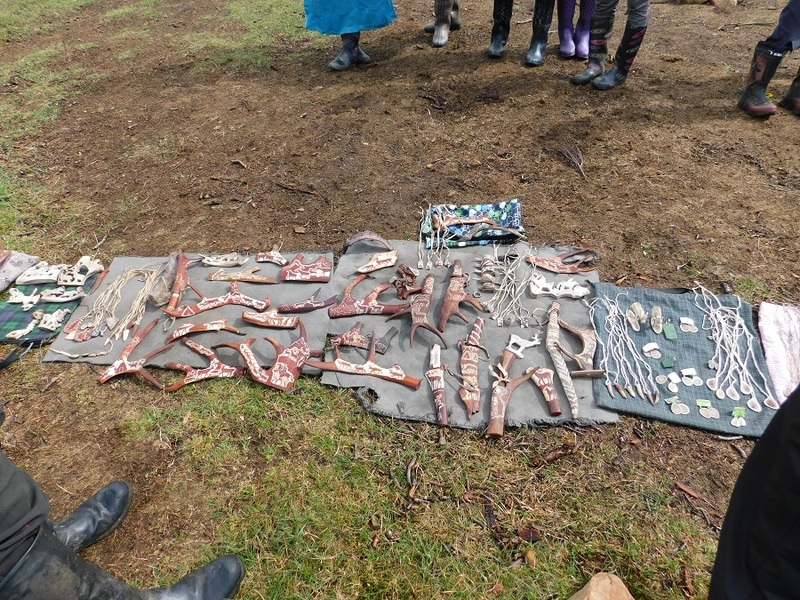 Our interpreter would shout, “sit center & follow the guide!” as we would slog through the deep pits of wet peat.Once out of the bog, we entered the forest of larch and pine and began to climb in elevation. The trail was wet and tough. Above the tree line, the weather changed once again. Dark clouds came rolling off the mountain. The thunder in the distance was gaining on us. With a CRACK of lighting, the skies opened and began to dump HAIL! We pressed on into the storm. Finally, the horses had had enough, they stopped & turned butts to the wind and hail. We sat there for what seemed an eternity on the side of that mountain, hail pounding on our helmets and filling my chaps like ice cream cones. As the hail subsided and turned to rain, we forged up the mountain to about 8000 feet. As we reached the top, the rain turned to drizzle, but the bone chilling cold was freezing our wet gear.Guess what?I was having the time of my life….REALLY!! First sight of the Tsataan Village. 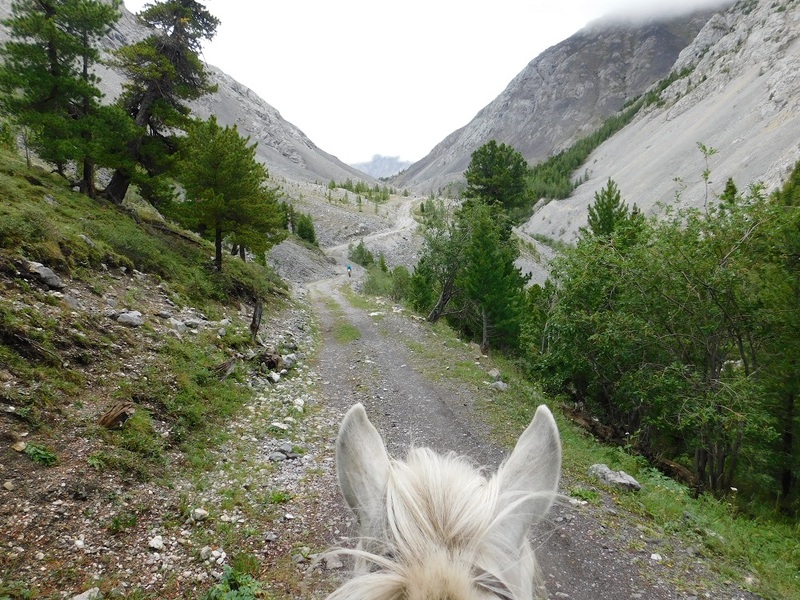 As we came down the mountain, I let my horse pick his path, zig zagging through the river of water over the sharp rocks created by the heavy rains. 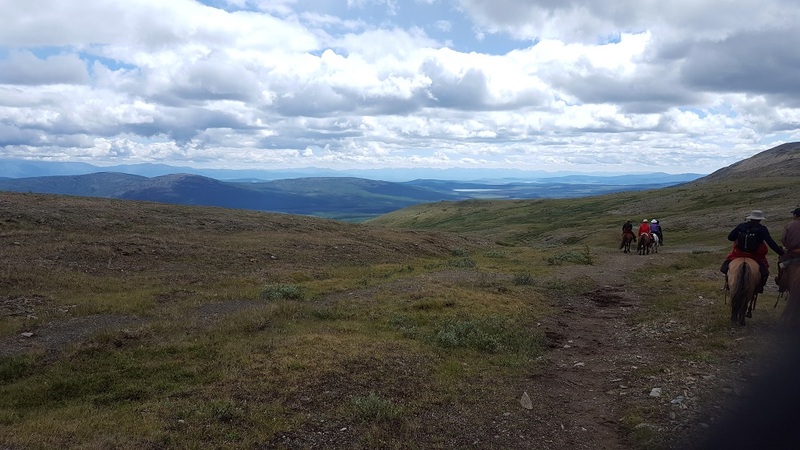 Suddenly, we could see the reindeer in the valley below.As I looked to the right, there was the village!We had arrived to see these beautiful people living off the harsh land. 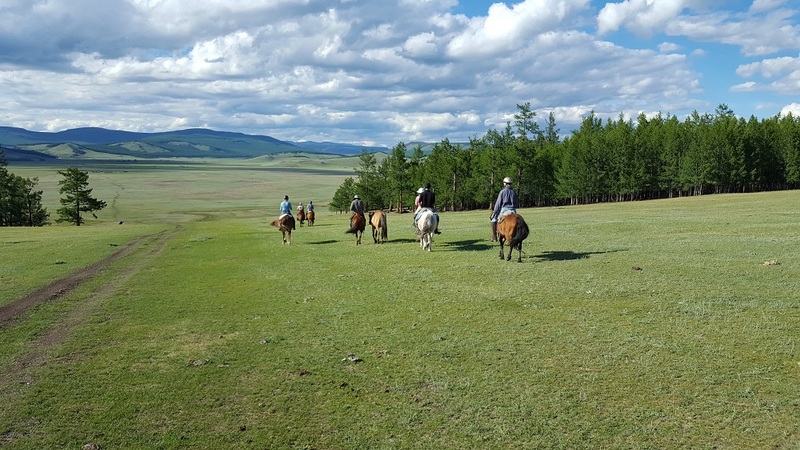 The hardest riding I had ever done, a true testament to the hardiness of this trusty Mongolian Horse. 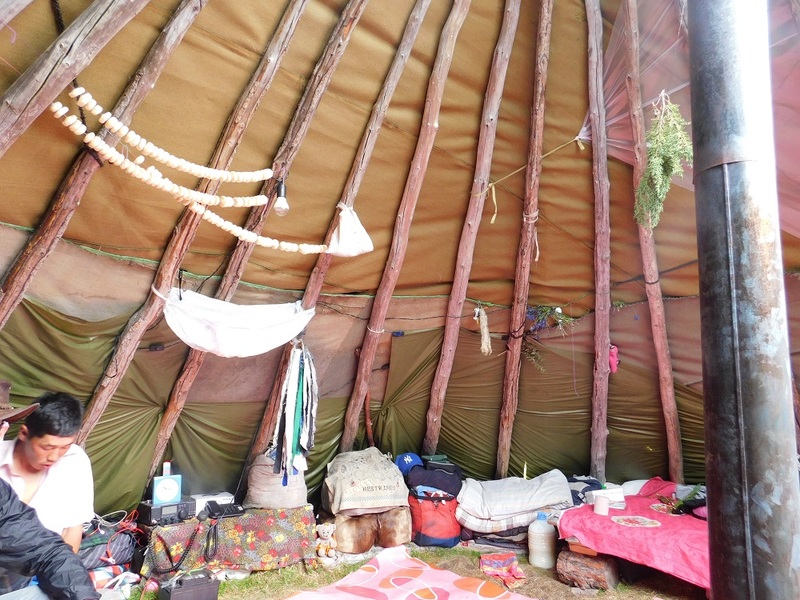 We arrived in time to be able to rent the two teepees (also called gers) available. Our host showed us to the girl’s ger which would also be used for meals.They started a fire in the stove where we could warm up and dry out. By the way, wet chaps dry by the fire in about 30 minutes! After lunch, the sun came out and it was time to meet the villagers. The ladies came to sell us their crafts. Beautiful carvings on reindeer antlers and stone. Julie & Baagii passed out gifts for the children and ladies of the village. 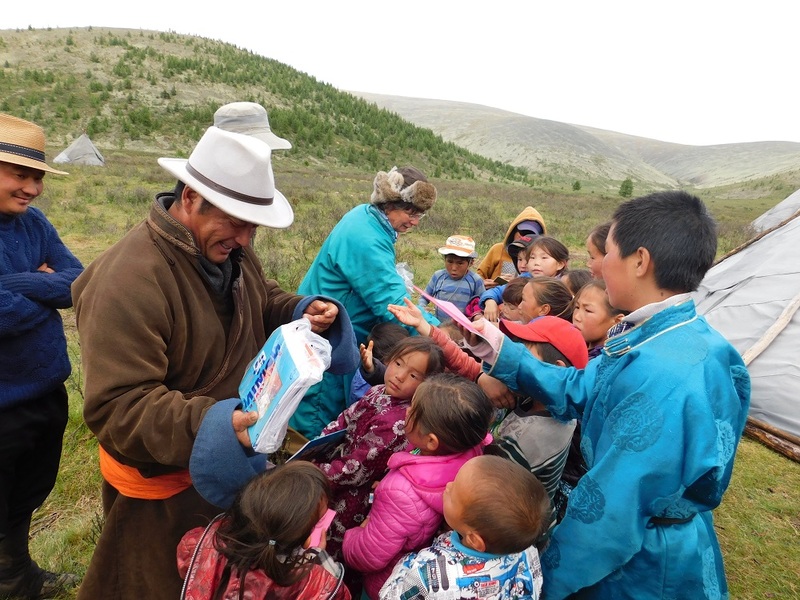 They were so grateful for gloves, hats, soap and face cream. These people make less than $100 per year! 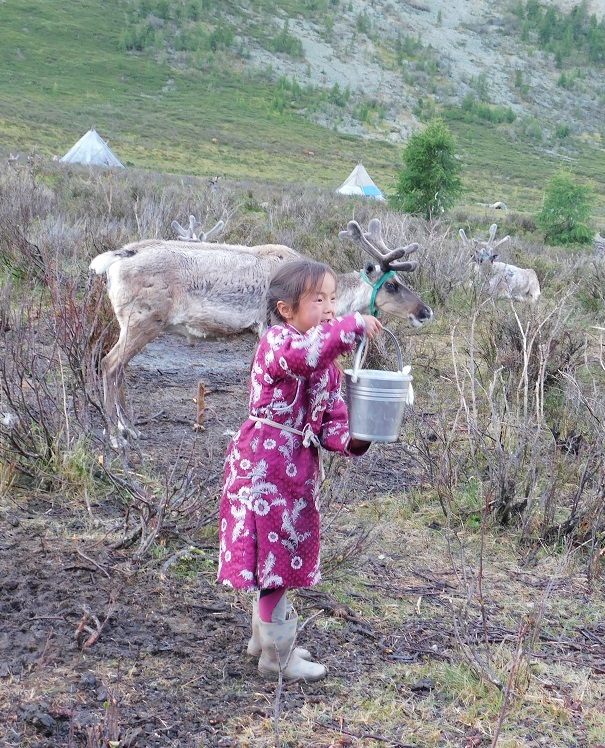 Reindeer are milked a few times per day. The calves are tied so that the cows will come to the center of the village to be milked. Once the milking is done, the calves are turned loose to nurse. 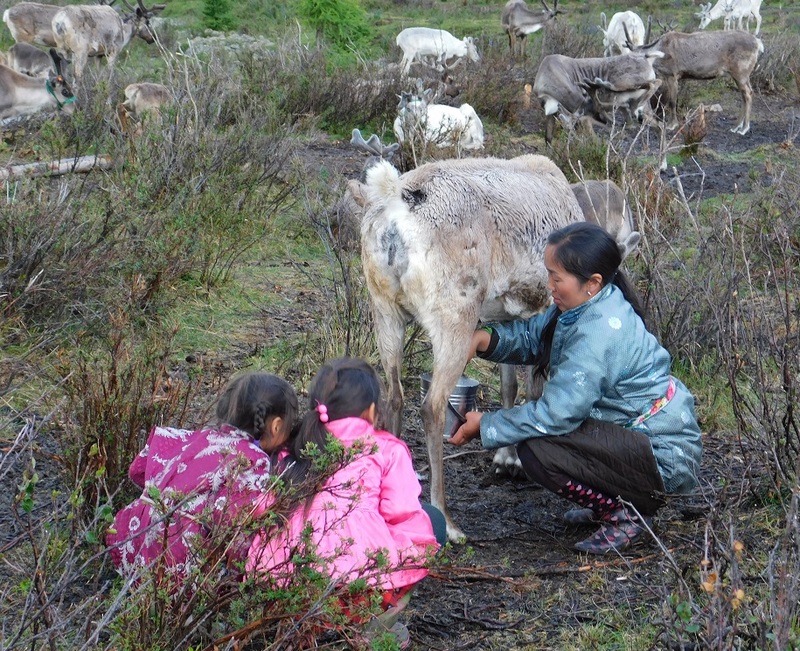 Milk, yogurt and cheese are the staples of the Tsaatan diet.They do not sacrifice a reindeer for meat unless either the hunting is very poor or there is a reindeer that cannot keep up with the herd during a move. After dinner, it was time for bed. 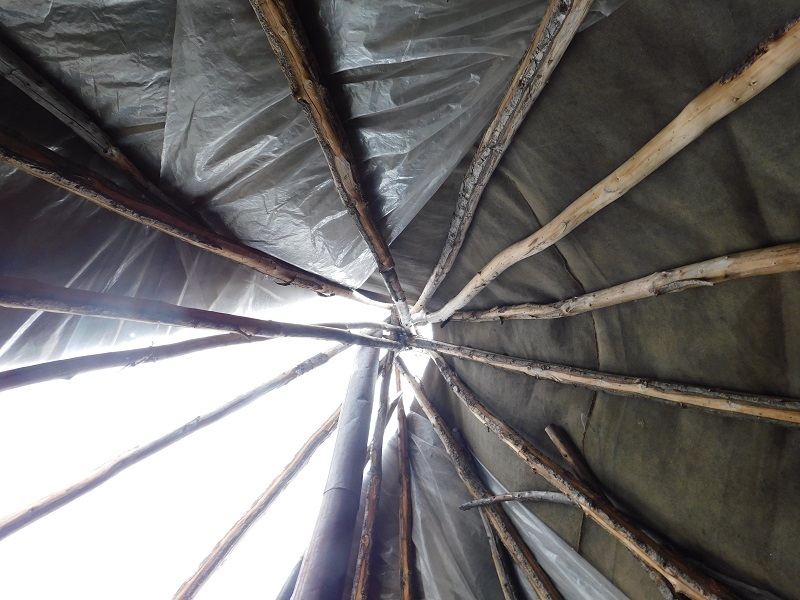 The teepee (ger) was warm. 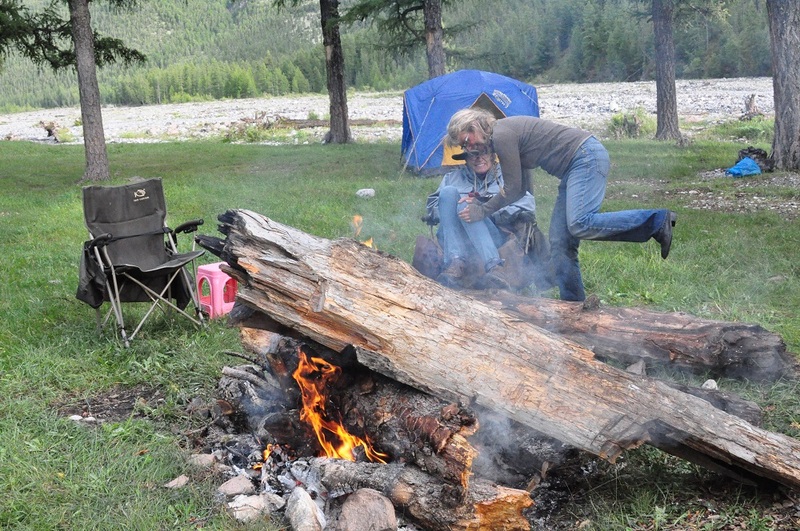 Our host came to stoke the fire as we retired for the night. Ask for that at your Airbnb! Day 7 - 5am. Our host gently flipped the door to the ger and came in to re-start the fire. I awakened and said “Баярлалаа (Bayarlalaa)” (Thank you. )Now we were all awake Julie begins to engage our host(ess) since she speaks Mongolian. We fired questions at her for as long as we could get away with it. Her name is “Maama”….yes, really her name & likely means born on Saturday. 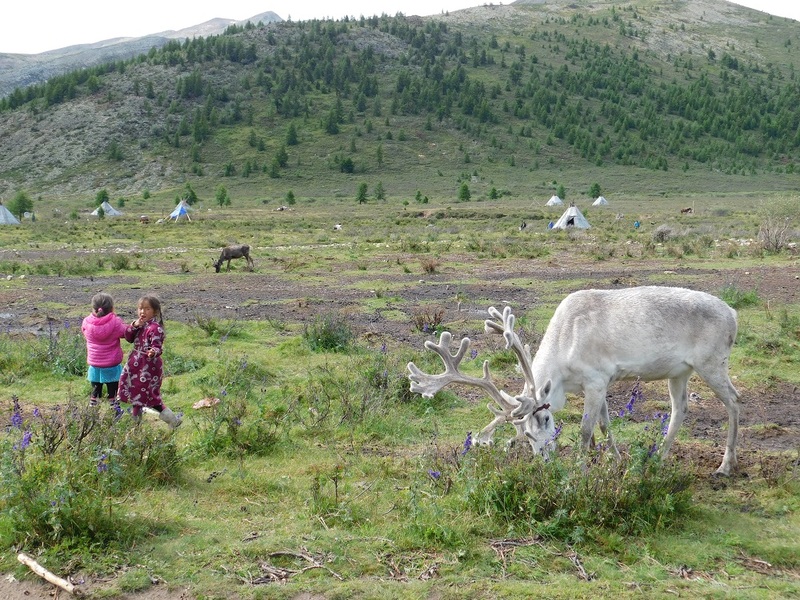 Each family has about 25 reindeer. They move 5-10 times per year. Men hunt, herd & help with the rearing of children. After breakfast, we visited the Shaman. Our visit was short since there was a group from Belgium working with the Shaman to learn his ways. Note the cheese drying on the string. 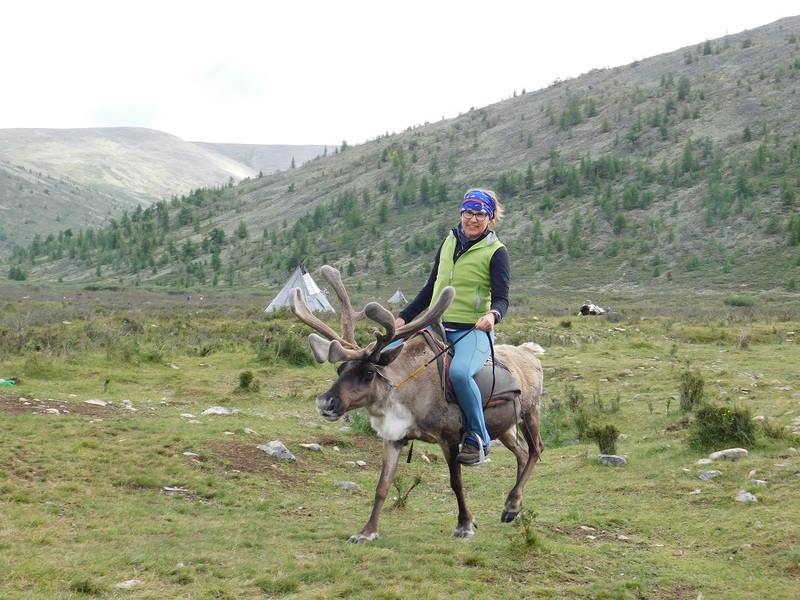 Each of us got an opportunity to ride a reindeer while in the village. Suitability of mount is a little off. As we left the village, I felt myself internally saying “wait, we didn’t have enough time.” We were all very quiet as we rode out and headed back up the mountain. 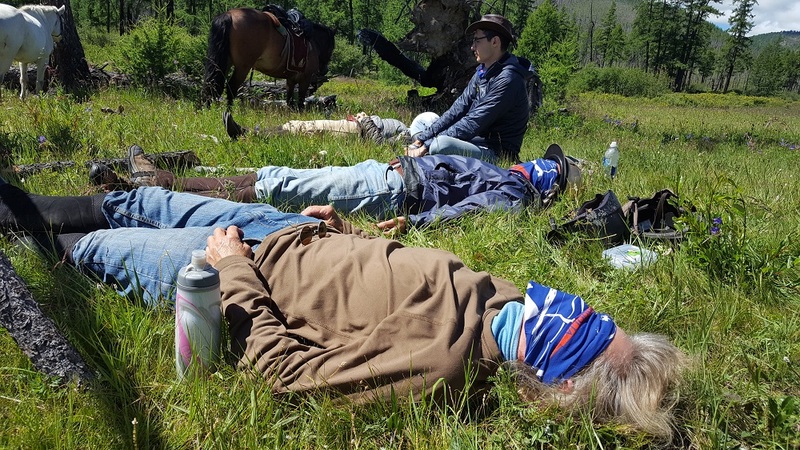 At the top, we stopped to rest the horses. It was a time to reflect on what we had just taken part in…it was incredible. The ride back to camp was so beautiful, we had not seen the beauty of these mountains in the rain and hail the previous day. 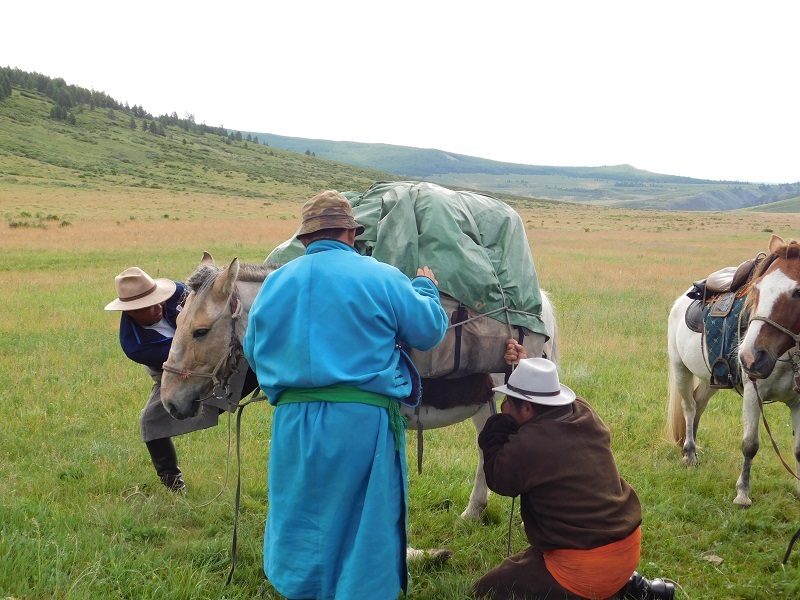 Here is one of the pack horses doing his thing, he came along loose as the rope had broken in the climb out of the valley. 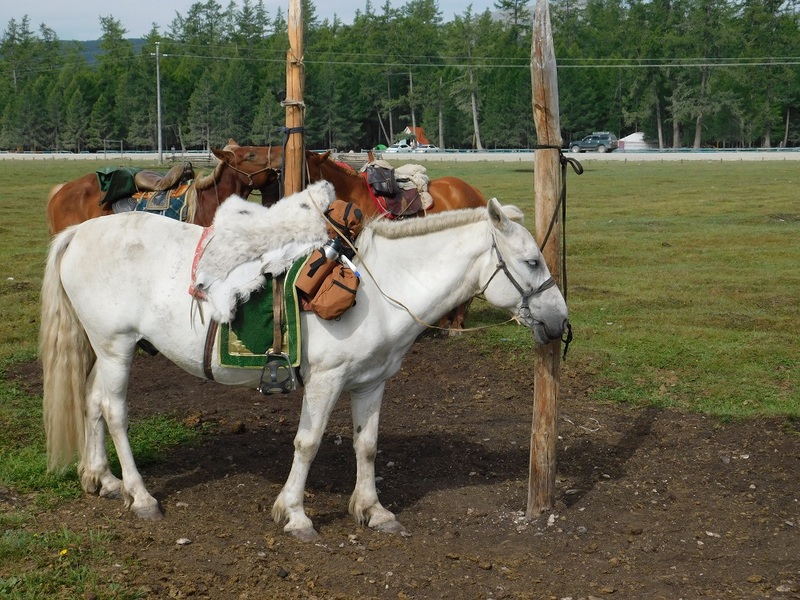 By the time we arrived at camp, I was ready to get off my horse. While it was not nearly as difficult as the day before, we were all tired.Likely some it emotional…. Day 8- “Life is like a theme park. You must get on all the rides you can before you get kicked out.” – Joe Colombeau. Trotting and cantering miles of green today. More horses, yak, sheep, & goats. Camp by the river so we could have a “bath.” It felt so good to be “clean.” Our site had a 360 view of the mountains. It was a good day to ride. We watched kids at play in the river and a young girl herd her sheep across the river. Osgokh our 17 year old guide. As the sun set, our herd grazed in the distance. This image was earlier that day...I just like it. Day 9- Short day of riding. As we stopped for lunch, we were told that this is where we would stay for the night. 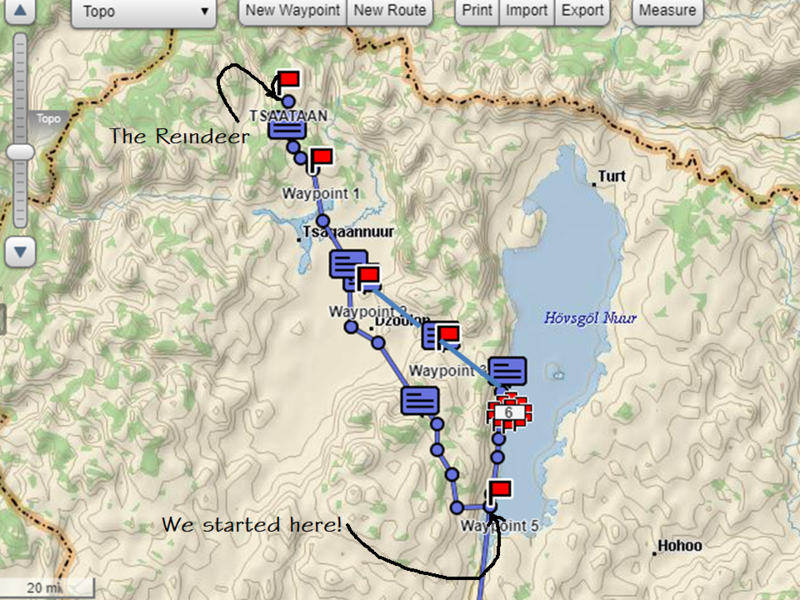 (not much of an itinerary on this trek…who needs one!) A nice spot by the river. Great for washing out clothes and plenty of time to dry them. Tried mares milk. Yup! The mares are milked and the milk is allowed to ferment, making an alcoholic beverage. It tasted like hard cider…. not bad! For dinner we were treated to Horkhog, a traditional Mongolian feast where a lamb is slaughtered for honored guests, and cooked with hot stones, potatoes, carrots and cabbage. It was delicious. Squeamish behavior here would be considered rude…. Day 10- Headed toward the mountains we would cross on day 11. 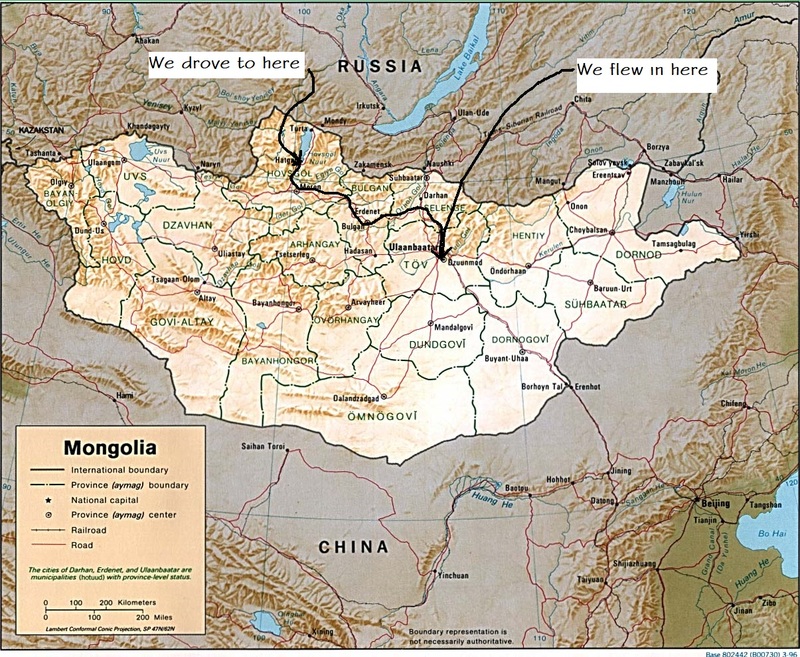 We rode more Steppe, more timber & some bog, crossed rivers & rode river beds. The timber was like an acoustical cathedral for our singing guides who had serenaded us throughout the trip. Their voices where larger than life in these woods. Upon arrival at camp, low and behold…. our tents were erected! Hallelujah! Just in time too. A storm blew in and it was a doosey. 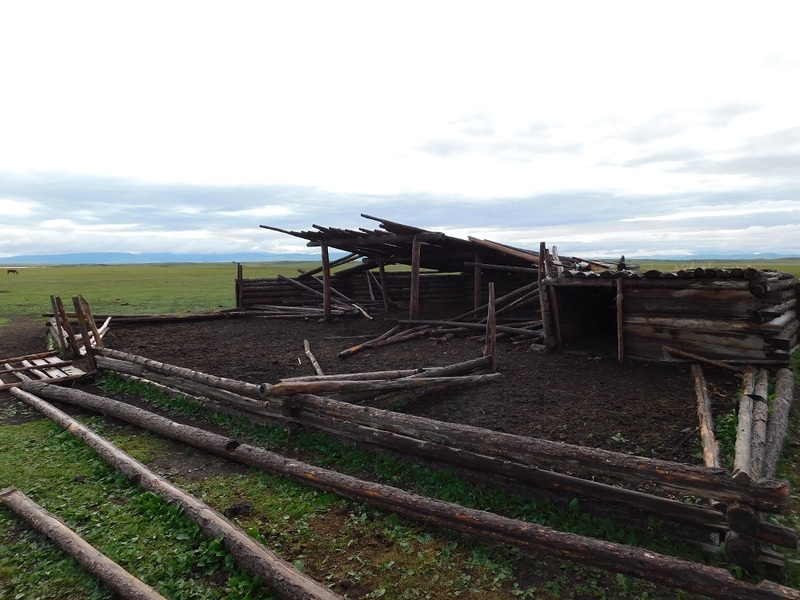 It blew away the guides tent across the meadow. 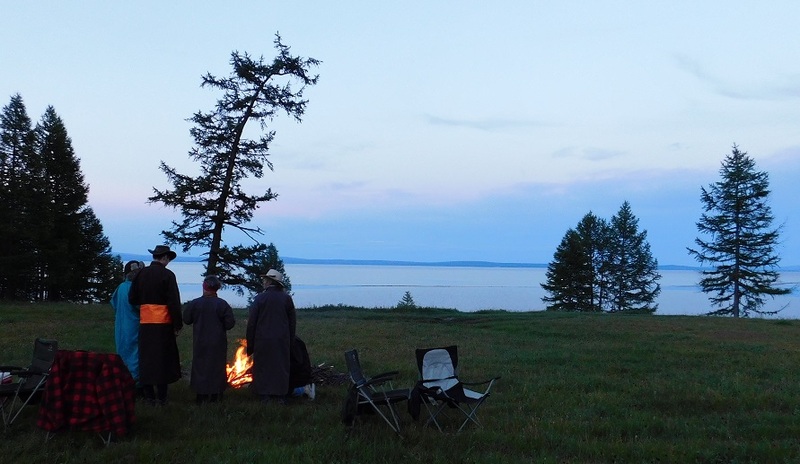 Later that night, we told stories of bears and ghosts and bigfoot around the campfire.Yes, the stories of bigfoot are in Mongolia as well. Day 11- cold rain at breakfast .I wore ALL of my clothes that day. (2 pair of pants, 4 shirts, fleece, raingear) We lit out for the mountain pass. Climbing higher and higher, the “road” was narrow and the drop down was far. At the mountain pass we encountered a Shaman Prayer Shrine. Great photo op of our whole crew at around 8000 feet. Camp our last night out was in yet another high meadow near a river. We were still at around 7500 feet give or take, so, when the warm sun slipped behind the mountains the brisk air set in. 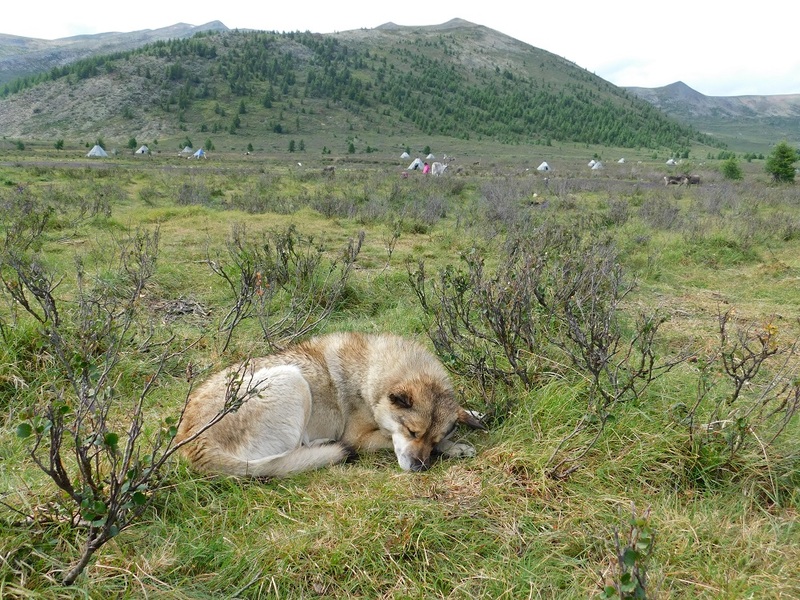 During the night, I could not stay warm; the cold was coming up from the ground. As I usually do, I needed to get up during the night. As I lay there, cold, trying to talk myself out of it, I just couldn’t. Now it was urgent. 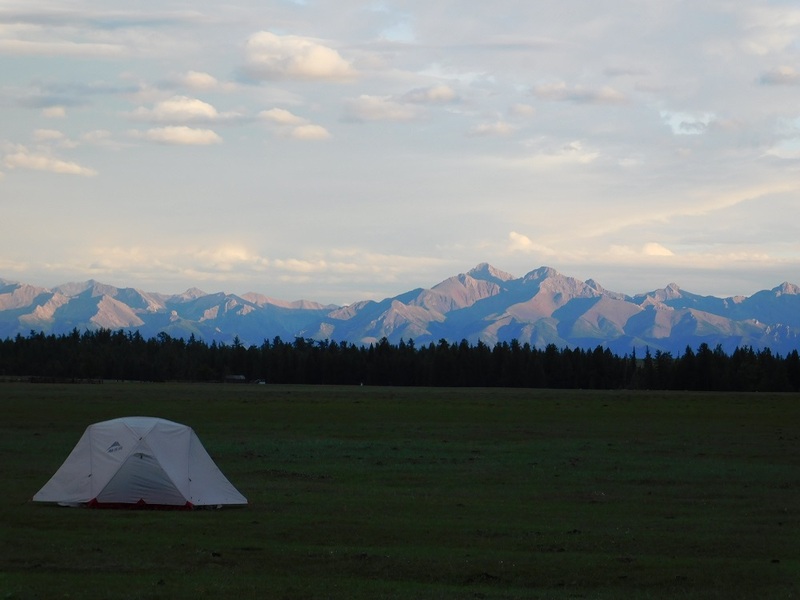 I unzipped my sleeping bag, slipped on my boots & reached for the tent zipper….it was frozen. There was ice on the tent. As the cold mountain air hit my face, it nearly took my breath away. Then I stepped into the grass, no… icicles. I wanted to shriek, but there were people sleeping & many of them OUTSIDE! Then, I looked up. Holy ****! The stars were incredible. The milky way so big, I was sure I could reach up & pluck it from the sky. THIS made the freezing night completely worth it & the image of the night sky is burned in my memory forever. Day 12- As the sun rose over the mountains to the east, the tent warmed and my feet began to thaw. Lorna & I had both had a very cold night. She of course was without her own sleeping bag which would have withstood those temps. But we were fine… and the memory of the stars made it all good. We packed up camp & headed back out on the trail. Back up out of the valley then the decent down to the lake. My horse seems tired today. In a discussion about his age, he was not the 13year old I was told earlier. He was actually 22.No wonder!The old boy did great. I am thankful for his kindness and surefootedness. 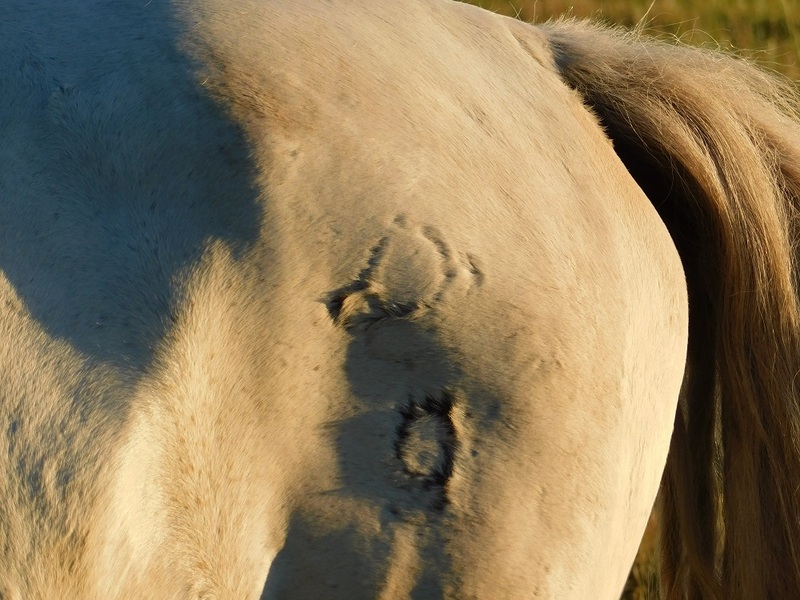 As we got closer to the lake, I began to rub his withers (Mongolian horses are not really petted & loved on like ours are) I wanted to let him know I appreciated him. It was an incredible trip. 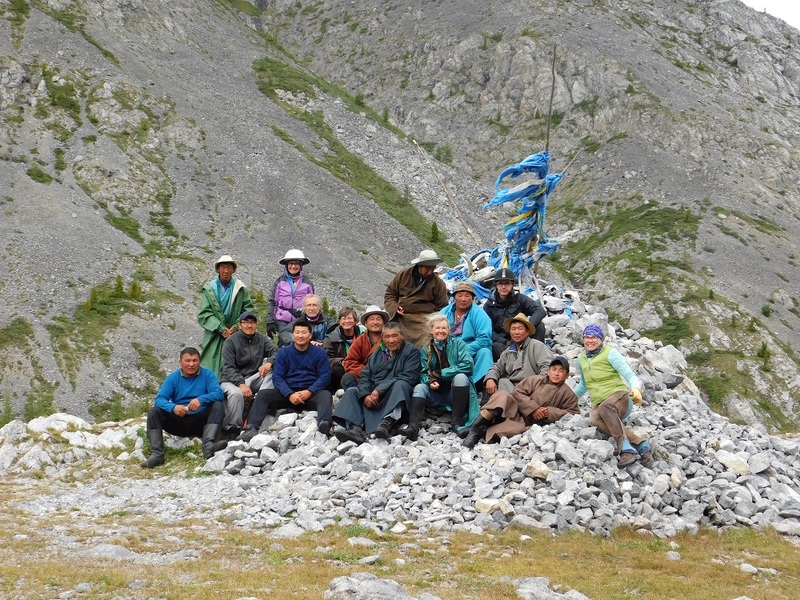 With incredible guides and trekkers and new friends. Lorna, thank you for turning me on to this adventure, for without you it would not have happened. I’m sorry it was not my bag that got lost. 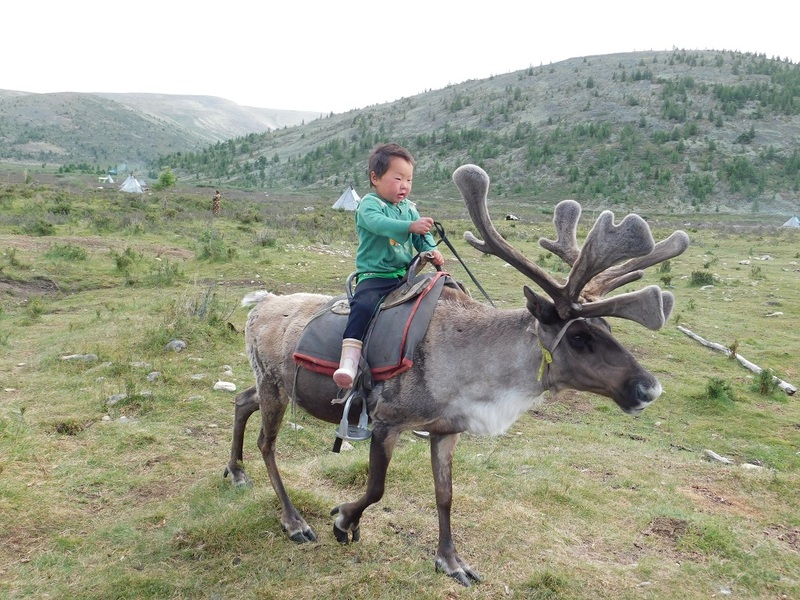 20% of the tariff from our ride goes to support The Veloo Foundation Children of the Peak Sanctuary, a kindergarten for 128 children who survive by scavenging at the garbage dump in Mongolia and the Soaring Crane Summer Camp for their older siblings.